Sure, the sometimes holier than thou notion of digital natives was a bit bunk. But, the idea that people who grew up with technology, learnt using technology and live with it as an everyday aspect of their lives have developed different skills (or perhaps different ways to apply the same skills) has resonance. There are a significant body of studies that argue this very point about Gen Y learners through to Gen Wi-Fi (or whatever we want to call them). Henry Jenkins took a stab at categorising them, suggesting that modern learners possess a variety of skills that have emerged from their interaction with web 2.0 technologies, including (but not limited to) the skills of play (problem solving through experimentation), performance (discovery through the adoption of alternative identities), simulation (interpretation of models of real-world processes), appropriation (remix and reuse of media content in the form of ‘mash-up’), multi-tasking (focus shifting required by the situation), distributed cognition (the use of tools to expand skills and thinking capacity), collective intelligence (the use and validation of pooled knowledge to solve problems), judgement (evaluation of the reliability and validity of information), trans media navigation, negotiation and networking (Jenkins, 2009) – quite the digital backpack. Yes, there is significant evidence that learners today are not experts in all technology. Yes, sometimes they come in and have NO idea what Facebook is, or how their camera on their smartphone works. Technology is not a class or category. It is a means, a society changing and generation shaping means. So, you scientists…you know everything about science-y things, eh? Then why do we expect all learners to be social media mavens or device professors? But what we can expect is that as Conole and Alevizou (2010) assert, the skills of digital learners are not universal nor consistent, as they have been acquired ‘for purpose’ as opposed to developing a toolkit of potentially useable skills, which requires the institution to both identify the skills gaps and rectify as required. What I want to argue for in this article is the imperative to look at, analyse and evaluate the way we as higher education practitioners see the role of technology within our pedagogy. On one hand the many of the ways we teach and assess are predicated on a model of work, practice and learning that is at best dated, at worst obsolete. On the other hand, the way we as academics use technology in higher education can be seen by learners as akin to watching your mum trying to twerk at your 18th birthday party. Not totes amaze by any stretch of the imagination. #mumreally? What we experience from our students and staff in reaction to both of these scenarios is often resistance, embarrassment and sometimes disengagement, all of which compromise student achievement and learning. There are disconnects of expectation, of practice and of outcome that need to be addressed in our pedagogy. And we have reached a ‘beyond critical’ state to start that process with the rapid emergence of MOOCs a salutary reminder of how quickly things can move (even under less than reliable premises). 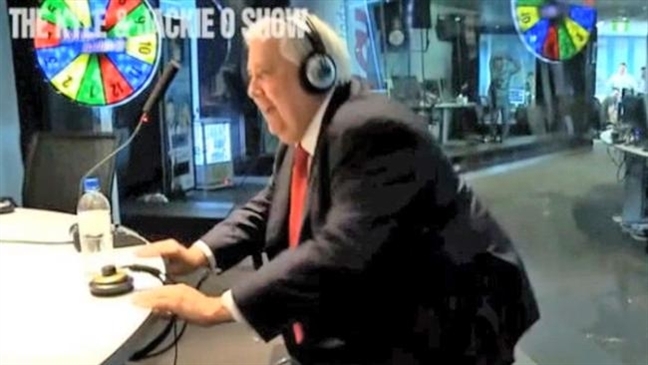 Australian Mining Magnate and now Member of Parliament Clive Palmer twerking on Sydney Radio. Wow. Disconnect #1 – What is knowledge and where do we find it? Knowledge starts as something we are told. Plato argues that a statement must meet three criteria in order to be considered knowledge: it must be justified, true, and believed. What did that mean for me when I was at university? It came from a book. An editor checked it, and then by virtue of publication it was assumed to take on those three criteria. Further, an academic aggregated, summarised and interpreted that knowledge and presented to me, as a told lecture. There was no crowd-sourcing. There were very few places for the collective outside of the establishment to form and create knowledge, to challenge what was believed, justified and true. The way in which knowledge is constructed, justified and communicated has changed. Without getting all philosophical, the way learners find, evaluate and share knowledge is different. Ideas emerge and bubble up through social media, through experience expressed as games, creative media or interaction. The emancipatory power of alternative media like zines has been rent large for the internet generation. Learners find knowledge through searching the internet, asking wikipedia or putting a post on a board to get a collective response (amongst many other ways including books mind you). What happens when they arrive at the university experience? They are told that Wikipedia is not a valid academic source. They are told that collaboration can sometimes be seen as collusion and that their community and communications should be filtered through the firewalled VLE. So what do learners do? Exactly as they are told! They go on the VLE and post using the same language they are expected to use. And they leave the crowd-sourced, creative energy for the projects and activities they do outside university. As one blogger on Kineo notes ‘They (Gen Y) are engine that has fuelled Web 2.0 and, unfortunately, they seldom get a learning experience in the workplace that looks anything like the world they inhabit so significantly in their spare time. Academy: Knowledge filtered and curated, from established sources. Disconnect #2 – What is the purpose of university? Professor David Helfand of Columbia University noted that many of his students that have different views of why they are at university, with student stating in a seminar ‘I am here for a degree, not an education’. There are disconnects between both the purpose of attending university and the understanding by which learners engage in university activity. Some of it is predicated on the dated notion that students are empty vessels into which we pour the knowledge and skills that reside in our heads. But some of it is of our own making. We have changed the way we describe and structure our university programmes to make them fit an employability agenda or what we believe ‘employers’ want. It is once again didactic. Listen to what we say, do what we tell you to do and you will get a ‘good’ job. There is a place here for a two-way conversation so that the notion of a degree as a product doesn’t become the norm. The role of teacher will change from instructivist to facilitative, leading and supporting user generated and peer sourced knowledge (see Steve Wheeler’s excellent and positive blog about this and most of all the transactive nature of learning in the modern university is supplanted by a collaborative one. The idea that we are preparing learners for jobs that don’t exist at the start of their degree has been well explored. But how are we doing that? Has our curriculum shifted to one that is trans-disciplinary and trans-context? Do we assume learners are developing skills that can carried through the career changes they will undertake through their long lives? Alvin Toffler noted that ‘The illiterate of the 21st century will not be those who cannot read and write, but those who cannot learn, unlearn, and relearn’. The disconnect lies in the ability of the university to step away from the ‘this is how you do it’ mode of teaching and learning. Learners come to higher education with experiences and ideas. These are often not valued as they sit in their first lecture of a new degree. And in many ways they are not assessed or recognised either. It goes back to the empty vessel model. Learning how to learn, knowing how they learn already and being an active partner in those processes should be at the core of a digital pedagogy. Some of the work on the ‘new university of the 21st century’ addresses the need to make our practice of teaching and learning transferable, complex, socially engaged and constructivist (or connectivist). But that aspirational goal is difficult to achieve by small incremental curriculum shifts and natural attrition. Much of what the OU describe in their annual ‘Innovating Pedagogy’ report, especially in the medium and long term, describes learning that is connected, crowd sourced and peer-led. Good words. All of them. There is one problem. Apparently we know the answers. Assessment is often designed to ensure that the students have remembered the answers as well. How does connected learning, seamless learning, crowd sourcing or student-led learning sit with that assumption? Well, a lot of modern teaching is still question based. We ask the questions, students go away and answer them. There are right answers and wrong answers (and sometimes very wrong answers). But the internet is not about the answers. Information is stored and housed, more than at any time in human history and certainly more than could be housed in any library. The key to effective internet use is the question. The disconnect cuts to the heart of our learning design and teaching practices. We are still caught in the notion that there is one right answer. For me this is the big one. Technology is not new. Smart phones are not the latest thing, Facebook isn’t trendy and you won’t be hip talking about Pinterest. Technology is ubiquitous, yet we as academics often get excited when we finally get to test something new in a class, whilst the learners grown about their lecturers being behind the times. Equally technology activity is not all about work and education. Most technology is about fun, social interaction, play and peers. Academics telling students that we are going to appropriate their Facebook for a course? Or even worse, telling them how to use the technology they already know how to use? No Dad, I already know who Tinie Tempah is, and please, you really have to stop rapping now at the kitchen table! #shutthehellup. There is a lot of evidence that suggests that students resist using the technologies they think of as their own (including devices) for purposes that they have not chosen. They are comfortable using the VLE or desktops in the library, but asking them to use and share their own devices can be problematic. A more realistic approach from the academy would be, here is a problem, how would you solve it and let them come to the technology they find most appropriate. It is a co-constructed approach. Language varies between generations. Pretty obvious really. Words lose and gain power. But the way language is communicated also changes. The patterns of change even in terms of digital communications are astounding. Even now, smart phone usage amongst under 18 year olds is on the decline in favour of tablets. 43% of students prefer to find content through social media as opposed to search engines (privileging peer and crowd based learning). Instant messaging is replacing email. There are standards, ethics, behaviours and cultural habits that emerge from these different modes of communication. Yet, we have academics who honestly believe that unless the student is looking at them they are ‘skiving’ off and probably just checking their Facebook. Some lecturers even have a laptops closed rule. I was a conference a few weeks ago, head buried in my iPad, thinking through ideas whilst presentations were on. I must have look disinterested, yet it was noticed that I often made the most pertinent tweets. People (and not just yoof) can multi-task, listen whilst not looking and can learn from more than your words. The devices they have are powerful gateways to knowledge. Sure, there are times when interacting face to face is what is required, and having the geek sit at the back at the room constantly tapping away is inappropriate. But that is not and should not be the default. Kregor, Breslin and Fountain from the University of Tasmania in Australia note that ‘…universities no longer have a choice about whether to implement e-learning: they must in order to remain competitive in the market place. Rather, their choices are about what vision or strategy to adopt and therefore what technology infrastructure and human resources to invest in’ (Kregor, Breslin, & Fountain, 2012). The other side of that coin comes from John Seeley Brown in 2001 when he noted quite presciently that ‘…today’s digital kids think of information and communications technology (ICT) as something akin to oxygen: they expect it, it’s what they breathe, and it’s how they live. They use ICT to meet, play, date, and learn. It’s an integral part of their social life; it’s how they acknowledge each other and form their personal identities.’ (Brown, 2001). With both the institutional pressure and the ‘customer’ pressure why do we privilege technology that replicates what we do now (VLEs for example) and why is it so hard to have a debate about the relevance of digital pedagogies? Allerton, H. E. (2001). Generation Why. Training and Development, 55(11), 56-60. Brown, J. S. (2001). Learning in the digital age. Paper presented at the The Internet and the university: 2001 Forum, Boulder, CO.
Conole, G., & Alevizou, P. (2010). A literature review of the use of Web 2.0 tools in Higher Education. A report commissioned by the Higher Education Academy. Jenkins, H. (2009). Confronting the challenges of participatory culture: Media education for the 21st century: The MIT Press. Kregor, G., Breslin, M., & Fountain, W. (2012). Experience and beliefs of technology users at an Australian university: Keys to maximising e-learning potential. Australasian Journal of Educational Technology, 28(8), 1382-1404. Tapscott, D., & Williams, A. D. (2010). Innovating the 21st-Century University: It’s time! Educause review, 11. Know your Product II – Are MOOCs the pedagogical messiah or just a very naughty boy? Much of the recent debate, certainly within the academic beltway, has been about trying to re-contextualise and develop new measures of success for MOOCs. Some of this ground shifting can be easily attributable to the poor picture painted by the more traditional statistics used to evaluate educational offerings such as completion rates and achievement. In terms of pedagogy, there is a further issue in that the role of the student within a MOOC is highly contested but rarely discussed. In early MOOCs, students were seen as part of the bigger, better, faster, more mantra that demonstrated success of the MOOC. More modern MOOC offerings have focused on engagement (did the student post to a forum? ), completion (did they demonstrate consumption of materials?) or the pot of gold at the end of rainbow, conversion (did they become paid students of the institution?). Liyanagunawardena, Parslow & Williams (2014) argue that dropouts don’t represent the learners behaviours especially well in that they may have got exactly what they wanted from a course in the first week or two, leaving satisfied (but officially ‘dropping out’). The issue here for me is that all of these presuppose understandings that we don’t actually know, which are occurring on a platform we can’t explain as most aspects of it are contested. Amongst these presuppositions are the questions around why students engage/don’t engage and why there is a significant issue with attracting 15-30 years olds where such an innovative pedagogical technology should be manna from heaven. In the end, universities are putting a lot of faith into something that has yet to attract much significant scholarship or critical analysis, yet are investing in technology faster than they ever have before (‘MOOCs Proliferate Despite Unanswered Questions’). In the midst of the forest of grey literature, evangelical musings and emerging criticality, there seems to be very little active research around the modes and models of learning occurring within MOOCs. There are a number of studies identifying participation behaviours of learners, teaching practice, the efficacy of specific add-ons or engagement platforms as well as a continued stream of mostly homogeneous demographic data. Most of this research is centred on xMOOCs and their massive data sets. There is a tendency within these studies to position the learner as part of the product, especially in the context of MOOC as reputational branding tool. To that extent, the idea of pedagogy is not the most important one in both the construction and evaluation of MOOCs. The simplest demonstration of this for me arises from the two–tier participation system, where top institutions are courted like the belle of the ball and those outside the top tier of the rankings are laughed at or ignored by the major platforms. There is significant evidence that some of the most innovative trans-disciplinary teaching and learning is occurring in these newer institutions by engaging in emerging fields of knowledge, innovative pedagogies and agile partnerships with industry. That is not to say that these things are not happening at top institutions, because they clearly are. However, where the focus of activity is on teaching and learning, there is a clear necessity to innovate as a form of competitive advantage. Now, if pedagogy and innovation are at the forefront of a successful MOOC platform, then the current platforms would be scrambling for these amazing innovative programmes. Funnily, they are not. So, in trying to get a better understanding of MOOC pedagogy and to understand what a post-MOOC world might look like once the hysteria and hand wringing have subsided, I have focused on identifying the challenges to understanding the beast within. What is a MOOC? What are the key identifiers and behaviours of a MOOC pedagogy? What does a post-MOOC world look like? Are we going to see the half buried head of a statue of Stephen Downes in the sand on a beach, holding his laptop aloft like a torch, with Charlton Heston dropping to his knees in despair? This would have to be the most fundamental challenge of all. There is no agreed definition of what a MOOC actually is. Every word in the acronym is challenged and changeable. From SPOCs to SOCCs, there are more silly names than you can find in an episode of Monty Python. How can we discuss the nature of MOOC pedagogy when we have little agreed idea about what a MOOC is? A recent tweet of mine noted that ‘I am now quite certain that the term MOOC is as well defined and understood as the ‘Boogie Monster’. When anything can be a MOOC, what reliable and valid means do we have to critically evaluate and understand them? At the same time, there seems to be an assumed meaning when MOOCs are discussed by academics that assume that everyone’s individual understanding is shared by the collective. There has been some attempt to delineate between connectivist MOOCs and the more didactic xMOOCs. But this still is broad brush when Massive, Open and even the on-line parts are constantly contested. We now see the weird sight of something that 2 years ago might have been called an online course fighting desperately to be labelled a MOOC. Various parts of our sector are scrambling over each other to ‘own’ MOOCs. It is akin to the day at school when yo-yos become popular again. Before you know it, newsagents, milk bars, supermarkets and gas stations are all selling them. All those loyal yo-yo sellers all year around either clean up or are swamped by the new craze. It is equally critical to understand why somebody is doing something, in order to help understand how they are doing it. In some ways, the MOOC-steria of the last two years reminds me of the Goldrush. There are hundreds of people panning for gold in the creek, hoping to find their fortune. Why did they start panning in that creek? Well, they saw a bunch of other people there so they thought they would start. When you go back to the beginning of the Goldrush, the person panning in the creek first is the person who owns the creek or more accurately, owns the shop up the road that sells the pans. When you hear a number of institutions talk about why they got into MOOCs most discuss the enthusiasm of the VC, the excitement of councils and boards who have heard about these things called MOOCs, the rumours of sacked Provosts in US universities and the ‘got to be in it to win it’ peer pressure akin to be goaded into trying your first cigarette at the back of the school oval. It would have to be the first principle of identifying a pedagogical approach to have a clear reason why learners are there (and what they hope to get out of participating), what benefits the institution seeks to gain, the benefits for the teacher and perhaps at an altruistic level, how does this contribute to the university’s societal mission. Yet, there seems to be very little clarity, aside from the competitive candy crush that seems to be occurring at the moment. This is not an uncommon phenomenon. When Nirvana broke over twenty years ago, record companies scoured the planet for other ‘grunge’ acts to be the new Nirvana, and in that grunge-steric few months we ended up with acts as diverse as Avril Lavigne (sk8er boi), Live (which led to Nickelback) and Ween (yes, I said it, I hate Ween!). MOOCs have often be referred to as the Napster moment for Higher Education. Now, I would like to firstly take issue with the premise of the statement. Napster was a user-led rebellion against the perceived greed and control being exerted by record companies in an over-inflated CD market (yes, who wouldn’t get angry at having to pay three times as much for something you had already bought, and sometimes sounded worse). It has led to other user rebellions in the form of Pirate Bay and bit torrent and eventually led to the success of legal streaming and downloading services like Spotify and iTunes. MOOCs are not a user-led rebellion. There is no ‘sticking it to the man’ here. It is the ‘man’ who is delivering and marketing these courses. The user does not generally (although there are exceptions) redistribute and become part of the network for the proliferation of the learning. Yes, there are huge numbers of ‘users’. Most of which try it once and leave, not to return again. MOOCs are not a revolution and Coursera is not Che. Right, with that rant over, let’s get onto the more relevant bit for MOOC pedagogy. Napster changed music distribution for ever, no doubt. But what happened to it? Bankruptcy, court cases, takeovers by Best Buy and a portrayal by Justin Timberlake in a David Fincher film all ensued. The most interesting part of Napster was the post-Napster world. What is most interesting for educators and strategists is what comes next. What is the post-MOOC world? What part of our teaching and learning practice will change because of the disruption, transformation or destruction of MOOCs? This is the critical question. What aspect of how universities do business will change? We already have the entry of new players, venture capitalists, tech entrepreneurs and young innovators into what has been a static walled garden of academic privilege and certification. This is not a level playing field. It is not enough to have a brilliant range of courses, experienced and inspiring teachers and a government mandated ability to issue qualifications in order to compete globally. Let’s be fair, it never has been a level playing field. Brands and reputations and rankings mean something and the ground continues to rise up and transform with the arrival of new players, emerging states and a mobile gang of learners. However, MOOCs have drawn these seismic changes into sharp contrast. The first challenge is what I call the in/out paradigm, where being ‘in’ the tent imbues you with innovative practice, cutting edge reputations and being at the forefront of technological change. Being ‘out’ of the tent labels you as curmudgeonly, conservative or more cruelly as a laggard. MOOCs are not an in/out choice, especially where the pedagogies on display are not substantially different in many instances to existing distance or online offerings. Who says what some institutions are doing is not MOOCs by any other name? Who died and made MOOCs the benchmark by which we decide how innovative we all are? I think you can guess my answer. MOOCs – The Choice of a New Generation. It is a conundrum that MOOC platforms should be seeking the most interesting, relevant and innovative ideas, practices and disciplines, yet by virtue of being owned by venture capitalists, investors and corporations and seeking the strongest, most recognisable brands to add to their supermarket shelves, ignore the institutions where these things are happening. It is important to note that I am not a class warrior. I work for a leading elite institution. I know the power of that brand, and the cool things we are doing. But I have had the distinct honour to also work for a number of institutions who would never be in the roadmap for the major MOOC providers, yet continuously deliver innovative, exciting, transformative programmes informed by relevant and agile digital pedagogies. This is not a call for revolution. This is a call for collaboration. If we honestly believe that MOOCs can transform and democratise education on a global scale, why are solely obsessed by brand values? This blog post seeks to identify what pedagogical innovation MOOCs represent in this fractured, and some would argue broken university environment still reeling from increased fees, the changing skills requirements of employers in a high unemployment world and shrinking global boundaries between systems and institutions? It would easy to argue that they are the messiah, bringing with them a new era in open learning, connectivity and smashing the cobwebbed ivory towers of the academic establishment. But equally it could be argued that they are a manifestation of the same old, same old; a web 1.0 mode of didactic instructivism and academic-centred content. In line with the emerging discourse around the superficiality of change seeded by or in response to technology in higher education (Blin & Munro, 2008; Garrison, 2011), I pose a simple final question – Are MOOCs learning 2.0 or just another attempt to re-package what we have already have produced, effectively the McDonalds Happy Meal of higher education, the same burger, fries and Coke that we have been served up consistently and efficiently for decades, just with a different plastic toy and a newer, funkier box? In reality, MOOCs are not really that innovative. They are a new name for something generally we have been doing for decades in terms on-line learning, adult education, community education, school learning, distance learning, external studies, computer aided learning, technology enhanced learning, you name it. xMOOCs especially are akin to the change YouTube made to the delivery of media in a classroom. We are still showing the same tatty old film, it is just on-line now, as opposed to coming from a dusty DVD or VHS. In reality, through the delivery of MOOCs the sector has not changed the way it teaches or in many cases, what it teaches. But there is an innovation in there, and it comes from the focus they have placed on the way higher education is perceived. There is a huge group of people out there demanding new ways of learning, new pedagogies, knowledge that transcends discipline boundaries and can be remixed, repurposed and reused. They are digital citizens, living in a world that has no boundaries between on-line and analogue. Social media is not a new-fangled platform; it is just another form of communication. These people are ignoring MOOCs in DROVES. Yet they are still consuming free, open and massive pots of learning through the internet, sometimes provided by a higher education institution and other times provided by their peers and friends. They are forming networks, making connections, sharing and making content and changing their world. They are under 30. They want something from universities, but they want more from the rest of the world, yet they show little or no interest in these world-changing MOOCs. Have they realised that it really just is a normal McDonalds hamburger they are being offered and they are looking for something far more interesting and finding it by searching on Google and asking their network of friends for advice? University is a place for the youth to find answers, develop ways to ask the right questions and make connections (physical and virtual) that will last a lifetime. MOOCs seem counter-intuitive to where the learner of today and tomorrow already is. And it is here that the challenge for institutions lies.